There’s no better way to make Christmas even more memorable than when you’re celebrating with your newest family member for the very first time. Baby’s first Christmas is a very special Christmas indeed! So how do you choose your little one’s very first gifts that will give plenty of fun and last the test of time? 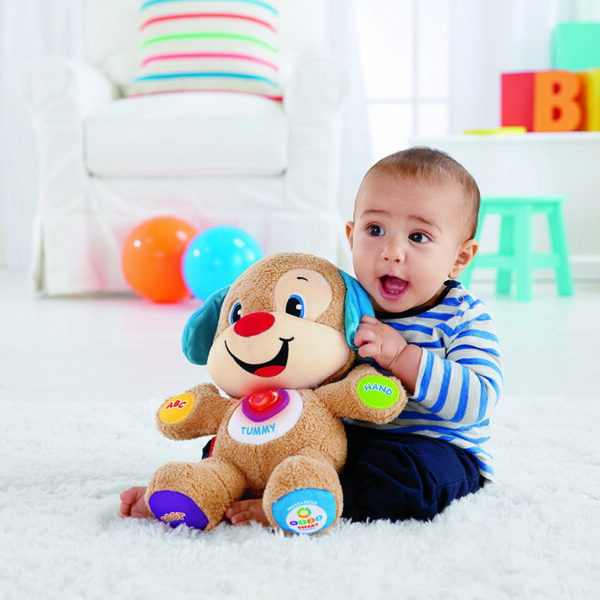 Fisher-Price has plenty of toys to choose from that will stimulate little brains and encourage learning through play. Five colourful rings are fun for younger babies to grasp, hold, shake and explore. The littlest ring has a shiny, reflective surface for baby to discover inside – with colourful, swirling beads that make fun rattle sounds! When your little one is ready to sit and stack, she can place the rings on the post, which will help her develop eye-hand coordination, then bat at the wobbly base to make it rock back and forth. Your little one is going to love playing with this classic toy. 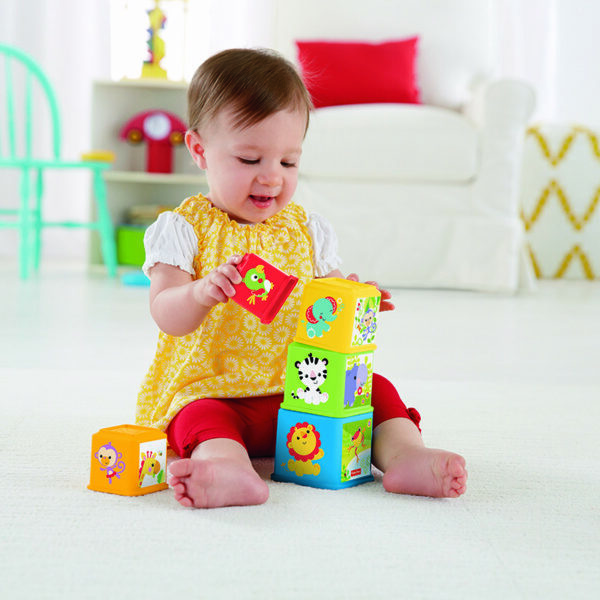 Each 5-sided block features bright colours, interesting textures, cute characters, numbers, and familiar first objects. Baby can stack them, nest them one-inside-another, or place them side-by-side to build a colourful scene. He’s the same soft, cuddly friend that responds to your baby’s touch with silly sayings and sing-along songs – but now he’s got Smart Stages technology that changes the learning content as baby grows! There are a variety of developmentally appropriate songs, phrases and sounds within three levels of play. Puppy’s light-up heart even twinkles along to the music! 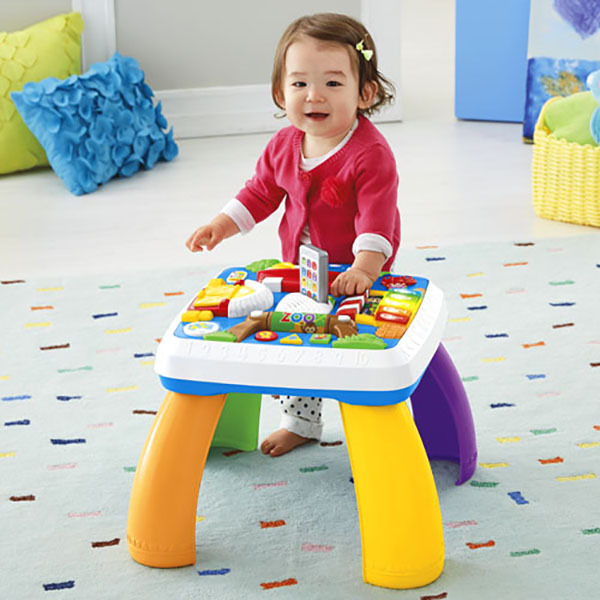 Your baby will discover tons of activities around every corner of this learning table. Head to the zoo and spin the roller to hear songs about animals – or press buttons to learn shapes in English and French. Take a trip to the farm and open and close the barn door. At the market, press the keys to play the piano and learn about numbers, foods and colours. Now it’s off to Puppy’s home. Open and close the door to hear Puppy sing his ABCs, and flip the light switch to learn opposites. And there are hands-on activities all over town to keep baby busy, including sliders, spinners and more.